The research, which was published in the journal Nano Energy, was led by Richard Kaner, UCLA's Dr. Myung Ki Hong Endowed Chair in Materials Innovation and a member of the California NanoSystems Institute at UCLA. The self-powered sensor is a type of triboelectric nanogenerator. 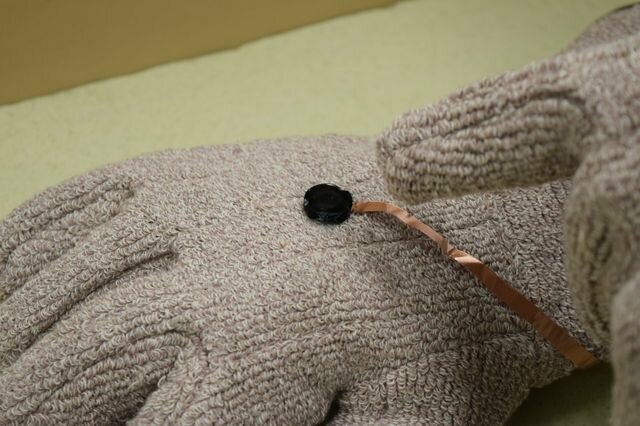 Triboelectric charging generates energy from the exchange of electrons when one material rubs up against another—in this case, the device itself and the wearer's clothing or skin, or the device and the ground. The phenomenon is the same as the one that creates an electric shock when you touch a doorknob after rubbing your feet on a carpet. The device, which the scientists dubbed FRTENG (for "fire-retardant triboelectric nanogenerator"), can detect when wearers are in danger or disabled because it can sense the difference between walking, running, jumping and stillness. "Different movements create electric signals with different voltages and currents," said Maher El-Kady, an assistant researcher at UCLA and co-author of the study. "Those different currents allow us to identify whether and how someone is moving—so the device could be integrated into a firefighter's shoes, for example, and send a help signal wirelessly in case of an emergency." Triboelectric nanogerators already exist, but because they use materials like flammable plastics and textiles, current models can't withstand fire or extreme temperatures, said Kaner, who also is a distinguished professor of chemistry and biochemistry, and of materials science and engineering. To overcome that obstacle, the new device is made from a carbon aerogel that the researchers invented. The aerogel is both extremely lightweight—95 percent of its volume is air—and stable at high temperatures, which makes it ideal for use in a fire-retardant device. "The carbon aerogel conducts electricity efficiently and contains materials that are environmentally friendly," El-Kady said. "Because the aerogel is so light, the wearer wouldn't even feel the device." To form the aerogel, the researchers mixed two chemicals, formaldehyde and resorcinol, with polyacrylonitrile fibers and graphene oxide sheets that were mere nanometers thick—a nanometer is equivalent to one-billionth of a meter, or about 1/75,000th the width of a human hair—to create a gel. The nanofibers and nanosheets provide support for the ultra-lightweight material. "Using triboelectric charging, the carbon aerogel functions as a motion sensor and a power generator," said Abdelsalam Ahmed, the study's first author, a visiting scholar at McMaster University. "Unlike traditional sensors that rely on batteries for their power, the new device can operate indefinitely without the need for any power sources." To test the device's fire resistance, the scientists exposed it to a butane flame for 90 seconds. They found that it not only did not spread the fire, but that it was self-extinguishing. And, even at 200 degrees Celsius, the device's structure was preserved and its electrical output remained stable. At that temperature, most conventional triboelectric devices lose performance or even catch on fire, Kaner said. El-Kady said the new device could also be useful on space missions—to track astronauts' vital signs or to generate emergency power, for example. Extreme temperatures often prevent the use of other electronic devices during space flight.